Using a Continuous Integration system is a very convenient way to organize the process of building, testing and delivering software. Jenkins has many plugins that enhance its usability, and one of these is the Jenkins Performance Plugin. 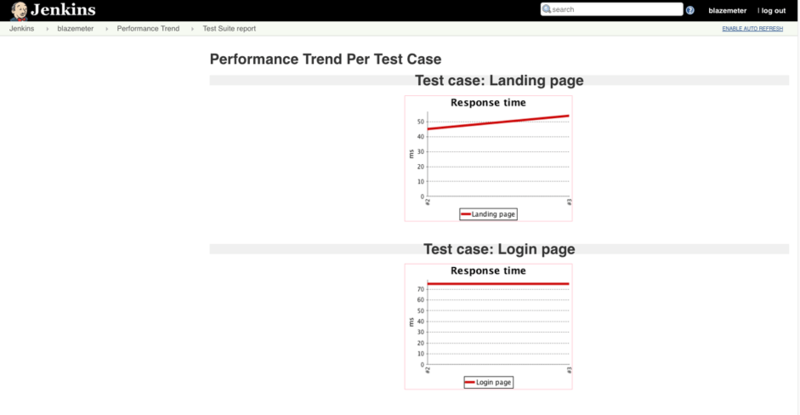 The Jenkins Performance Plugin allows users to run tests using popular open source load testing tools, get reports from them and analyze graphic charts. This ability is very important for testing the stability of applications. 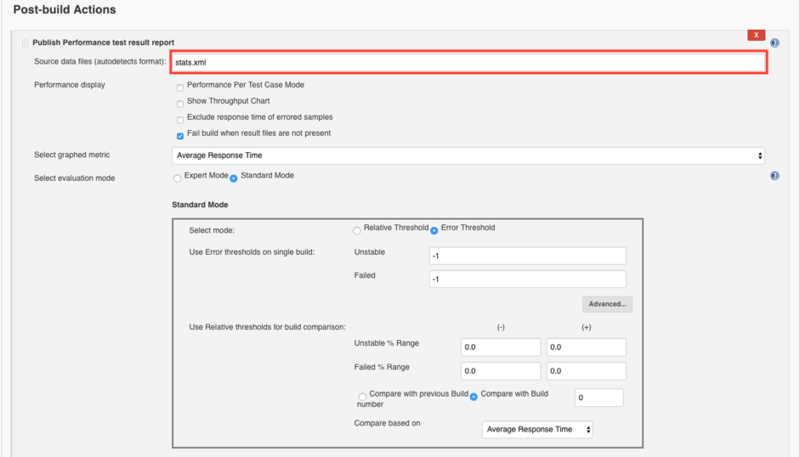 In this blog post, we will review how to use Jenkins with this Performance Plugin. 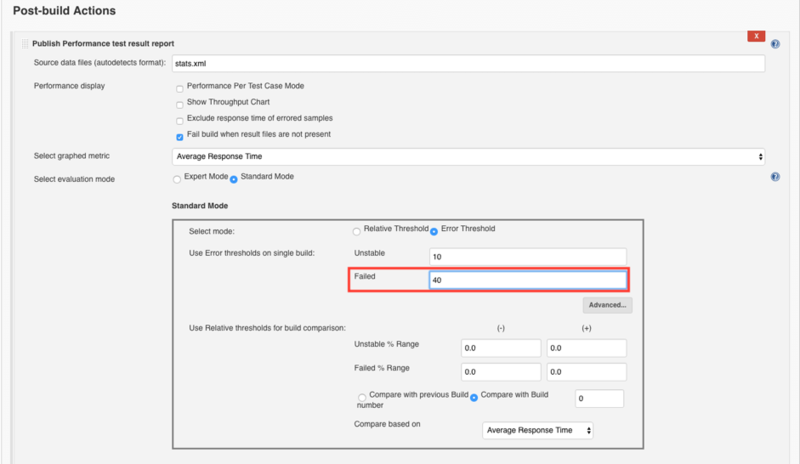 You will learn how to organize performance testing in each software build, so you can better understand if your application is stable under a load. Running performance tests in each build can help us determine if recent changes are causing problems, if there is a more gradual degradation of system performance or if your system is able to handle its traffic load optimally. This plugin is managed, maintained and evolved by BlazeMeter’s Andrey Pokhilko. Let’s start by creating a simple JMeter script for demo purposes. I chose the BlazeDemo website (http://blazedemo.com/) to create our performance script and run tests. 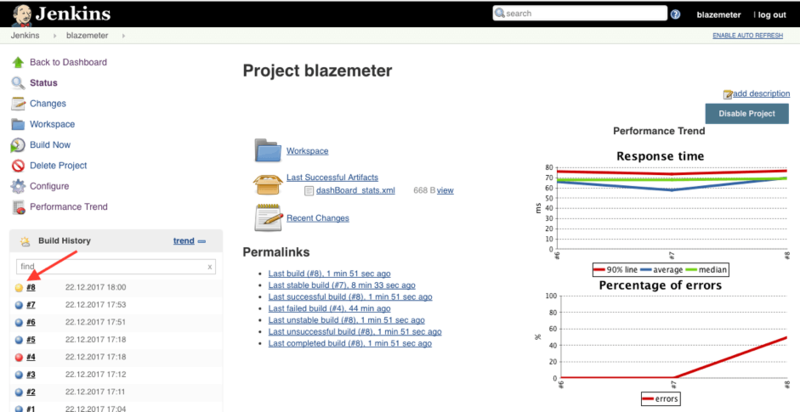 The BlazeDemo website is available to the public for testing and trying out performance scripts. 1. Add a Thread Group to the Test plan. This Thread Group will run the script 10 times for 10 concurrent users with a Ramp-up time of 2 seconds. 2. Add a HTTP Request that opens the landing page of the tested web app. This is the first step of our demo script that just opens a landing page. 3. Add a HTTP Request that opens the login page of the tested web app. This is the second step of our demo script that simply opens a login page. This script is done. Store it with the name ‘blazedemo_script.jmx’. 4. Create a Freestyle project in Jenkins. After saving the project we will see the configuration page. 5. Set up a performance test to run the JMeter script directly. The Run Performance Test section should be presented with only one field available: ‘Taurus tool parameters’. Use the Advanced button to see more. Let’s not change anything in the advanced options for now. Just make sure that the ‘Automatically generate performance report’ checkbox is checked. 6. Find the Performance Trend menu item. Check the side menu, you should see the Performance Trend item in it. The presence of the “Performance Trend” link means that we added a Performance test run to each build. 7. Add the JMeter script to the project location on the Jenkins machine. NOTE: The project folder appears only after the first run of the project build. Great! We are ready! Now a performance test will run after each application build. 8. Build the project a couple of times and check the graphs on the right side of the Status screen. We can see three graphs on the right side of the page: Throughput, Response time and Percentage of errors. This page contains the same three graphs as the Status page and three links to other pages: Last report, Filter trend data and Testcase Trend. Let’s review the internal pages. The "Last report" means the performance report for the latest load test build according to the date and time. The last report page contains a graph of the response time and detailed information for each step of the script. The table under the graph contains columns: URI, Samples, Average (ms), Median (ms), Line90 (ms), Minimum (ms), Maximum (ms), HTTP Code, Errors (%), Average (KB), Total (KB). Here we can configure the trend graph with some options: show only the builds in a certain range of dates; show only the last n builds; show only from nth to nth. Nth to nth means jumping by counts of n. For example, if the user sets n = 5, the performance graphs will show the 5th, 10th, 15th, 20th ... builds. If the user sets n = 10, the performance graphs will show only the 10th, 20th, 30th ... builds. This page contains separate response time graphs for each step of the ‘blazedemo_script.jmx’ script. We considered one way to run a performance test. Let’s take a look at another approach by using Taurus. You can also use Taurus to run your performance test on Jenkins. The advantages are that you can change parameters like the number of concurrent users, the number of iterations and so on, without having to change the script itself. Instead, all of these configurations can be done within the config file. The following steps replace the steps we performed in Jenkins. 4. Set up the Taurus config file. This config file means that the ‘blazedemo_script.jmx’ script will be run for 10 concurrent users, 10 times, with a ramp-up time of 2 seconds. The report will be saved to ‘stats.xml’. 5. Set up the Performance test result report. 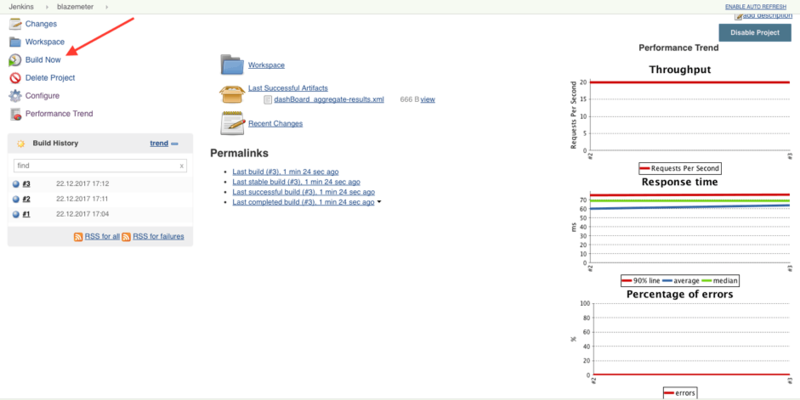 The Publish Performance test result report section should appear. It contains a number of options and fields to configure the report. Let’s see how it works in action. Those changes are enough to give us the default report for our performance test. 6. Review the new Performance Trend page. As in the previous steps build the project a couple of times and go to the Performance Trend link. As we can see statistics are taken from the stats.xml file and have only two graphs by default: Response time and Percentage of errors. The page also contains tree links: Last Report, Filter trend data and Trend report. The first two work similar to steps 10 and 11, while the Trend report is new. This page contains a table with detailed information about each performance test we have run. The table consists of the following columns: build, 90% line, percentage of errors, average, average kb, errors, max, median, min, total kb. Cool. Now we know how to configure performance testing using Taurus. But it is also very useful to know if our application is stable enough under load. To check out how to do that, let’s configure Jenkins to change the build status based on the percentage of failed requests. Set up the Error Threshold. This configuration will mark the build as unstable when errors are at 10% and as failed when 60% of our requests failed. OK. Let’s “fix” our script to fail half of the requests for demo purposes. Add a Response Assertion to the Login page sampler in the JMeter script. Configure this assertion with a false assertion so it fails the login page request. We need it for demo purposes. Replace the old script with the updated one in the project folder on the Jenkins machine. Build the project one more time. The build is marked as unstable (yellow color) since 50% of the requests failed, which is between 10% and 60%. This configuration will mark the build as unstable when errors are at 10% and as failed when more than 40% of the requests failed. Build the project and check the results. The build is marked as failed (red color) since 50% of the requests failed and this is above the 40% threshold. 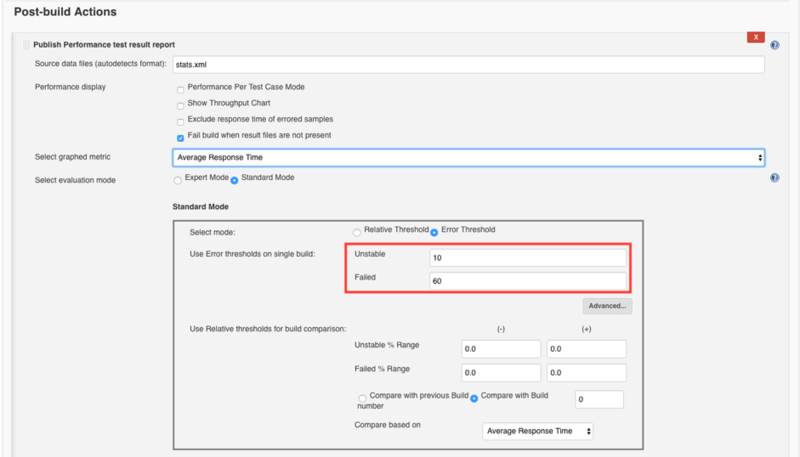 In this blog post we considered: how to run a performance test after each build just by using a JMeter script and Taurus; how performance reports work; and how to mark a build as unstable or failed based on the level of failed requests. 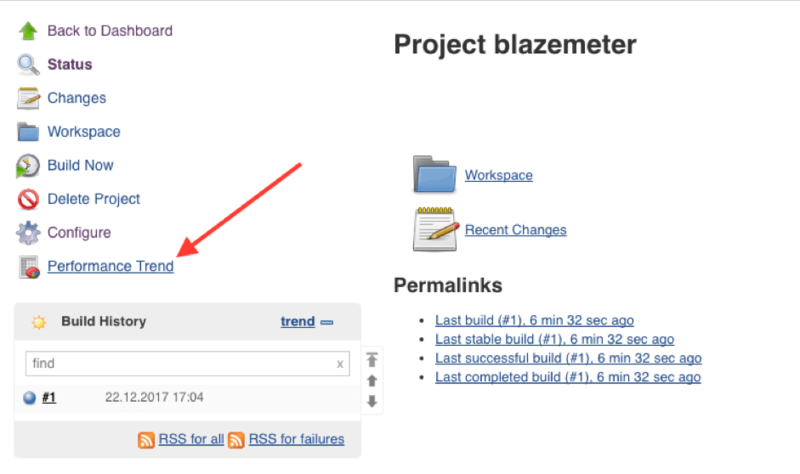 For successful requests, you can also open your Jenkins reports in BlazeMeter by clicking on “View External Report”, and get scalable tests from multiple geo-locations and more in-depth analysis. I hope this post was interesting and that you found something interesting to try out! For more information on configuring continuous integration check out our other blog posts: Continuous Integration Performance Testing, Continuous Integration 101 and How to Run Taurus with the Jenkins Performance Plugin. 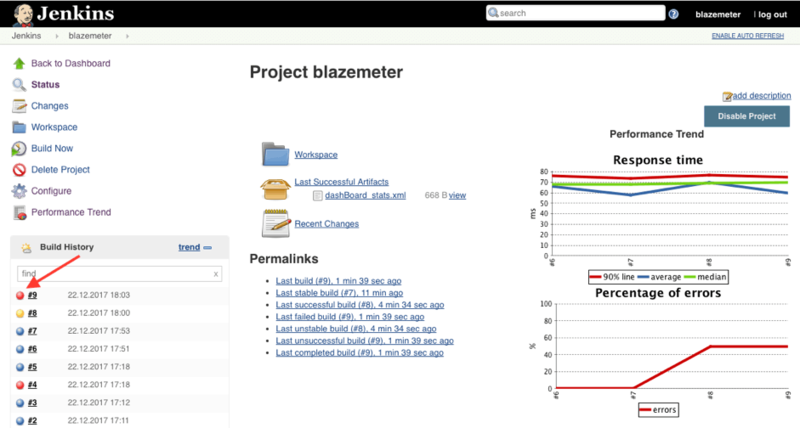 To try out BlazeMeter, request a demo or put your URL in the box below, and your test will start in minutes.